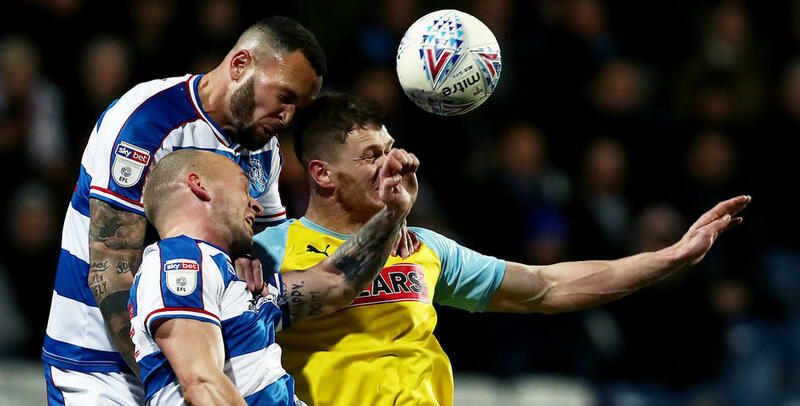 A FORGETTABLE evening at Loftus Road, as Rotherham United scored a 95th-minute winner to earn their first away league victory of the season. 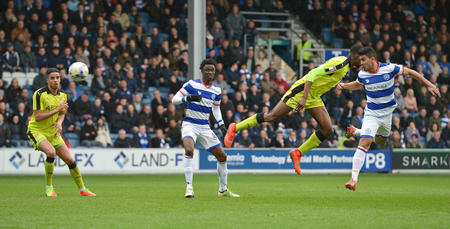 A Championship affair devoid of any real quality, Semi Ajayi’s 71st-minute effort gave the visitors a 1-0 lead in W12. Bright Osayi-Samuel looked to have earned under-par Rangers a point when he equalised in the 85th minute at the Loft End. But the drama hadn’t quite finished there – Ajayi again on target in the fifth minute of added time to give Paul Warne’s Millers their first Loftus Road success since 1951. Following our goalless home draw with Stoke City on Saturday, Rangers boss Steve McClaren made four changes to his team for the visit of Rotherham. After his red card for a second bookable offence at the weekend, Grant Hall missed out to serve a one-game suspension. Josh Scowen, Pawel Wszolek and Nahki Wells dropped down to the substitutes’ bench – which included Geoff Cameron following his lengthy absence with an ankle injury. Darnell Furlong, Joel Lynch, Osayi-Samuel and Ebere Eze were all subsequently drafted into the Hoops’ starting XI. In a 4-4-1-1 formation, QPR lined up as: Joe Lumley; Furlong, Toni Leistner (captain), Lynch, Jake Bidwell; Osayi-Samuel, Massimo Luongo, Jordan Cousins, Luke Freeman; Eze; Tomer Hemed. When the contest got underway, Rotherham fashioned the first effort on target – though Michael Smith’s eighth-minute header did little to trouble Lumley. However, visiting goalkeeper Marek Rodak was called into more of a save at the other end a minute later – his outstretched leg diverting the ball wide after Hemed turned a Freeman flick-on goalwards. Rangers shaded the possession count before the break, though the first half made for a relatively-even and unspectacular encounter with very few opportunities. Eze’s 24th-minute distance effort, that was comfortably collected by Rodak, was the only other time either ‘keeper was tested ahead of the half-time interval. In all, it was an ugly opening period. Things didn’t get much better thereafter. Rangers survived a bit of a goalmouth scramble in the 48th minute. Four minutes later, Eze dragged handsomely wide from 20 yards. In the 56th minute, Rotherham’s Jon Taylor fired a tame effort into the arms of Lumley. Osayi-Samuel spurned the best chance of the second half yet in the 61st minute, racing onto a ball forward from Leistner before lashing over from 14 yards. Then visiting forward Smith wasted arguably an even-better opportunity seven minutes later – heading wide from eight yards after being teed up by Joe Newell’s left-wing cross. But the deadlock was finally broken by Rotherham in the 71st minute. After the ball broke to Ajayi 25 yards from goal, he subsequently produced a thunderous low attempt which darted into the bottom left-hand corner. Rangers responded by throwing on Wells and Olamide Shodipo almost instantly, for Hemed and Cousins, and Wells should have levelled matters in the 76th minute. Bidwell’s hopeful ball forward led to a mix-up in the visiting backline, thus allowing the Bermudan striker to run clean through on goal. However, an equaliser wasn’t forthcoming as, despite beating ‘keeper Rodak, the ball clipped the outside of the left-hand post before trickling wide. 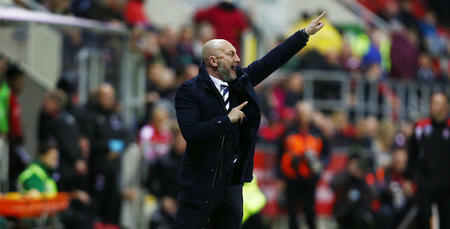 QPR’s third and final sub was used 10 minutes from time, as Eze was replaced by Wszolek. And five minutes later, the Polish international was on hand to assist the goal that looked to have spared Rangers’ blushes. Wszolek latched onto Bidwell’s dinked ball forward before crossing low from the left, then Osayi-Samuel slid in from six yards to bring the R's level. However, after three minutes of injury time were signalled, Rotherham scored in the 95th minute to earn what could well be a vital win in their battle to beat the drop. Sub Anthony Forde’s free-kick was met by Ajayi, who planted his header past Lumley for his and the Millers’ decisive second goal of the night.